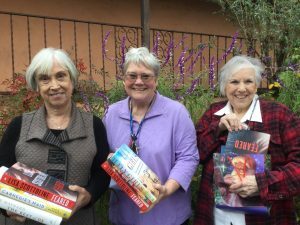 We feature this special Spotlight story from Peggy Schrader, whose life and the lives of her book group members were profoundly affected by the Camp Fire that ravaged Paradise, California. A special thanks to Peggy, and continued wishes for the solace that a good book can bring. On November 8, 2018 the little town of Paradise California woke to a bright orange sky. Right away I knew something wasn’t right. By that evening 27,000 people had been evacuated due to what became known as the Camp Fire. Prior to the fire I was very excited because my book club, which was one of four Newcomer Book Clubs in Paradise, had just won copies of Lisa Scottolines’ novel Feared. I planned to pass them out at our monthly meeting the following week. Instead I found myself emailing Reading Group Choices to tell them I was sorry, but I would not be taking a picture of our group with our books to submit to the newsletter. Within several days I received an email from Mary Morgan from Reading Group Choices offering her condolences and telling me as soon as things settled down she would like to send us a box of books to help everyone rebuild their library. Now months later, members from all four book clubs have scattered across the country. Each member received their books either in person or in the mail. Those of us remaining will band together and continue to read, discuss and enjoy each others company the way we did before November 8. In the photo from left to right, Ann Slocum, Peggy Schrader, Ginger Medbery. To enter to become a Spotlight group, email a picture and description of your group to info@readinggroupchoices.com. If your group is chosen, we will send you and your group a box of discussable books and a copy of our most recent edition of Reading Group Choices.